Hi, everyone! Selena from Find Us Lost here. You might remember me from my last travel guide highlighting Tokyo, Japan or from my Switzerland travel diary. I moved to Europe from Los Angeles last year with my husband and we’ve been traveling ever since. 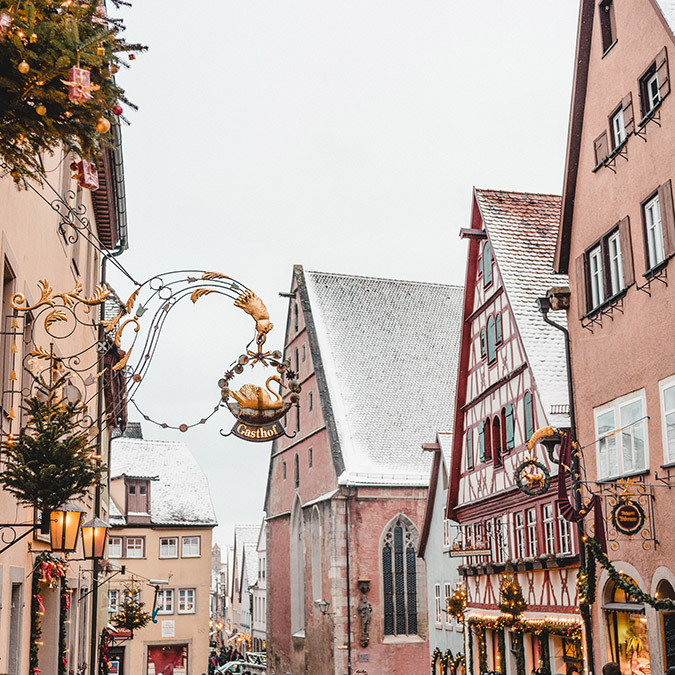 I’m so excited to share my latest trip with you: a road trip through Germany and France, visiting Europe’s best Christmas Markets! 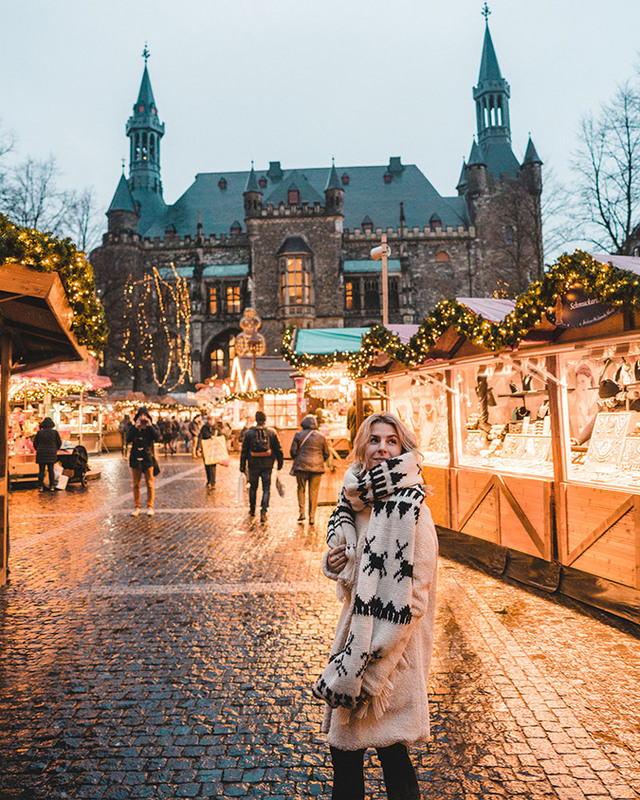 Last year was our first winter living in Amsterdam, so we finally got a taste of Europe’s Christmas Markets. I fell in love with them instantly. 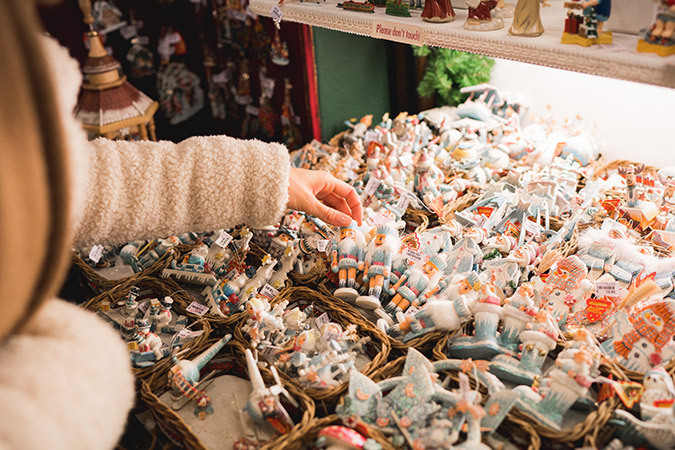 This year instead of visiting one or two Christmas Markets near us, we planned a (fairly last minute!) 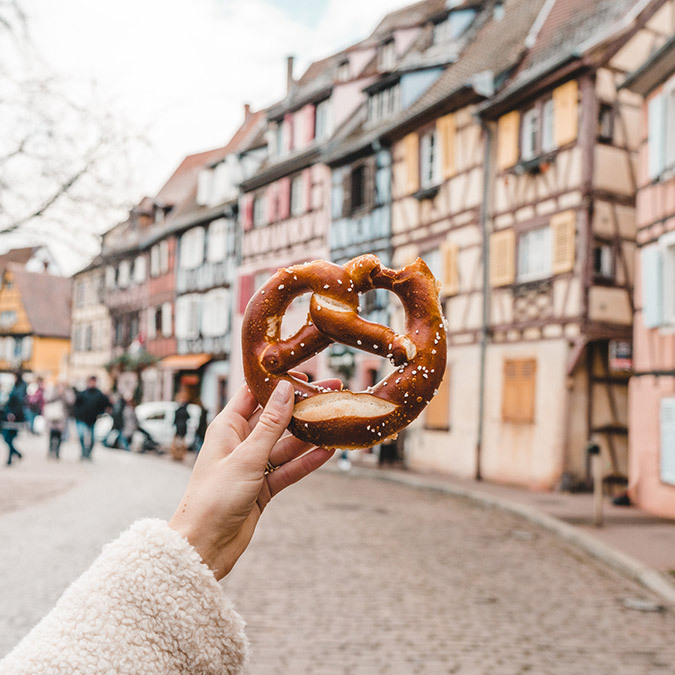 road trip to see six of the best markets across Germany and France. 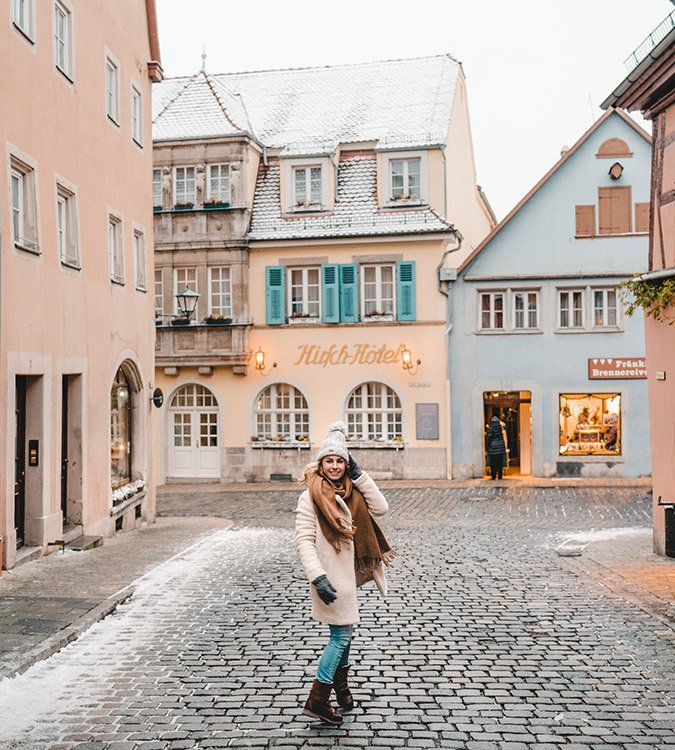 Some of my favorite highlights from our trip included: catching the first snow of the year in the medieval town of Rothenburg Ob Der Tauber, waking up in a castle overlooking the city of Bonn—and of course gorging ourselves on sweets, glühwein (hot wine) and German pretzels. 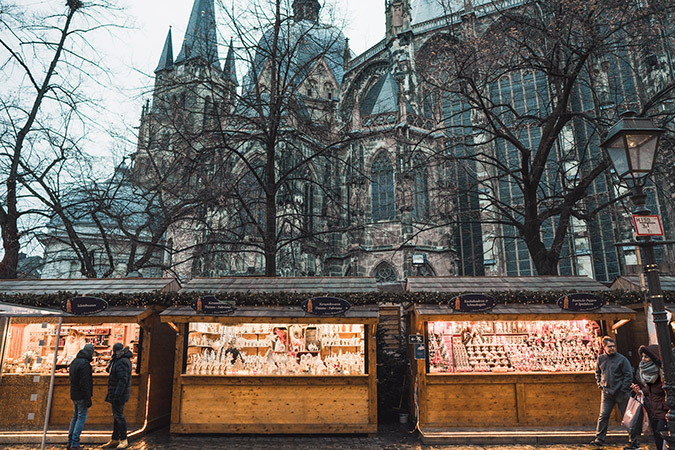 Our first stop was the German town of Aachen, located just a few minutes away from the border of the Netherlands. This market definitely has a ‘local’ vibe and is family-friendly. 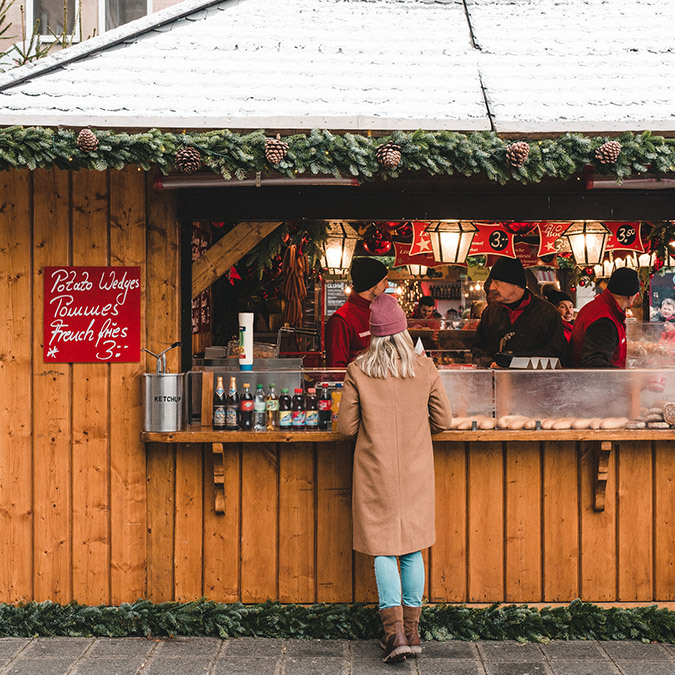 The stalls featured a nice mix of handmade ornaments and decorations, and there were plenty of stalls to step inside for some hot wine. It was easy to park nearby and there was plenty to explore around the main market square. What we bought: Mushrooms with garlic sauce and Krakauer (German sausage). Where we stayed: Hotel Kasteel Bloemendal, which was one of the best values of any hotel I’ve ever stayed at! 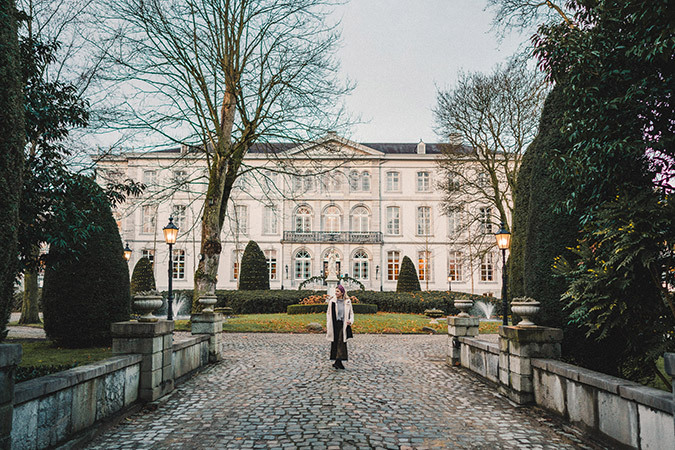 It’s a luxurious castle-turned-hotel in the Netherlands, located a short 15 minute drive from the market in Aachen. 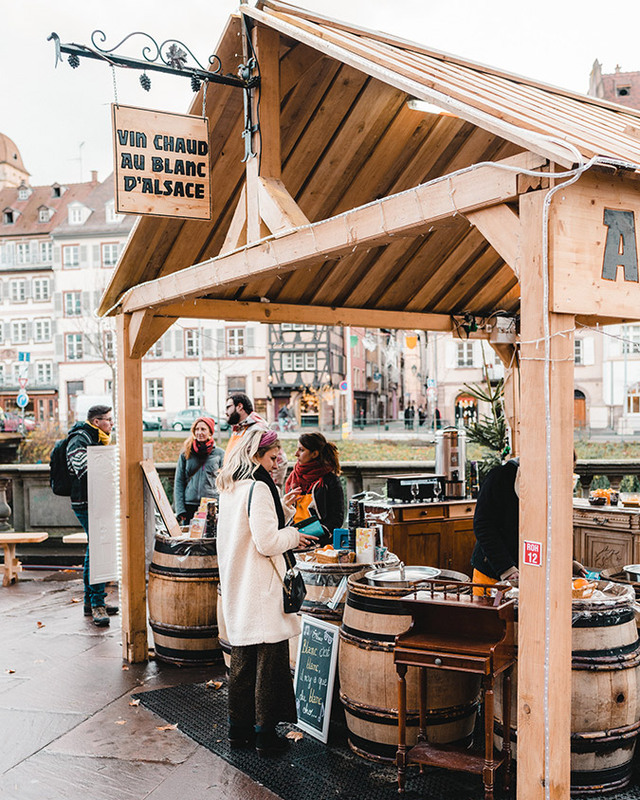 The Strasbourg Christmas Market has been voted a European favorite market multiple times. 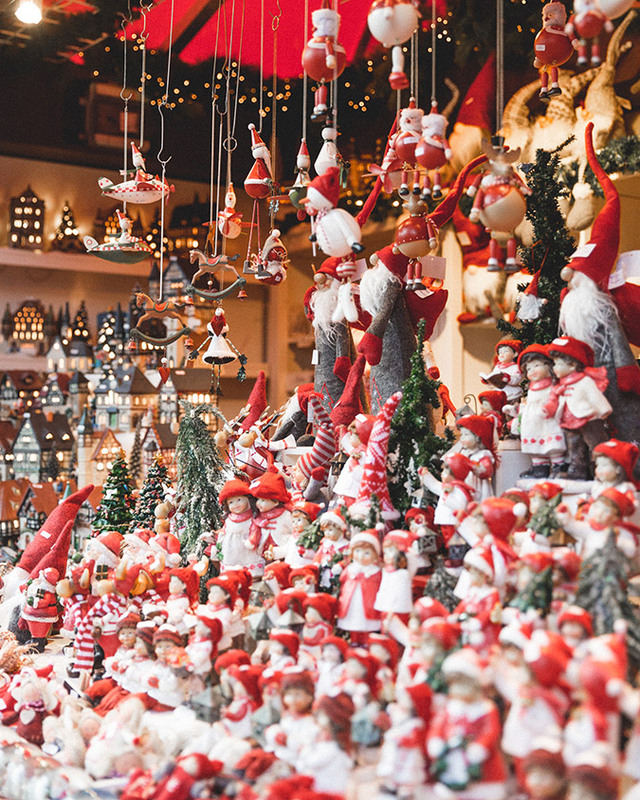 It’s also the oldest Christmas Market in Europe, with the first market taking place in 1570. 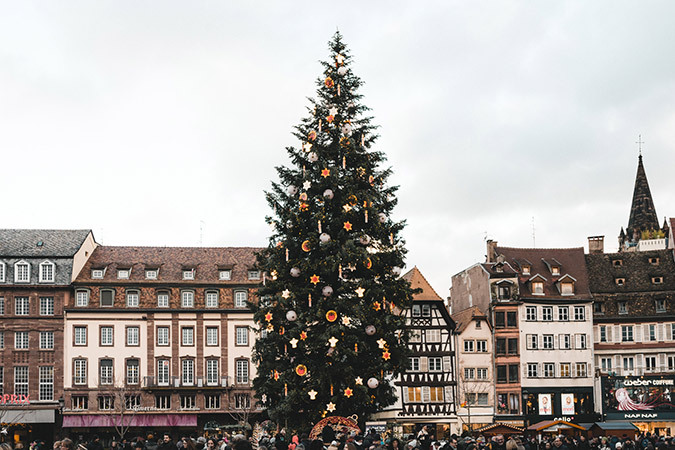 The stalls are set amongst the dramatic backdrop of the Strasbourg Cathedral and the square also has a large Christmas tree, which makes for some amazing photos. We loved the overall feel of this market and definitely could have stayed longer to explore the city! 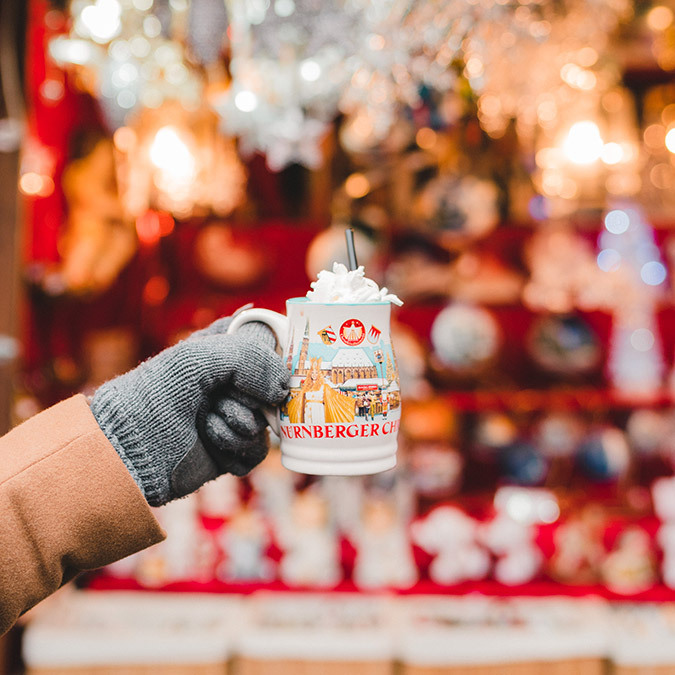 What we bought: Chocolate pralines and plenty of Glühwein. Where we stayed: Hostellerie De La Pommerie, which is located right in between the Strasbourg and Colmar markets. 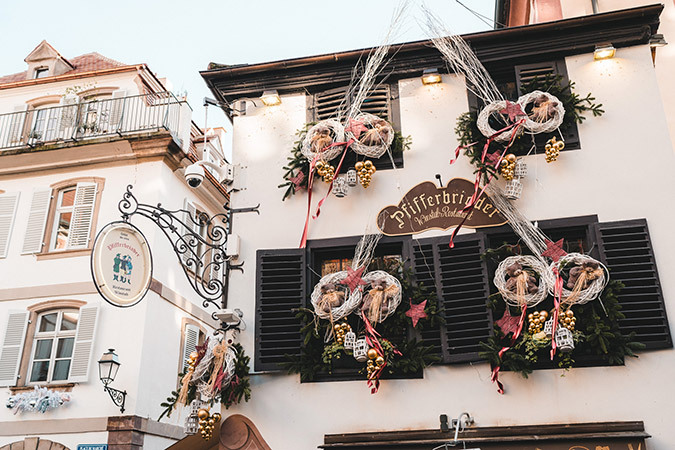 The service at this quaint boutique hotel was exceptional, and we loved that we were staying outside of Strasbourg town (which gets very crowded this time of year). 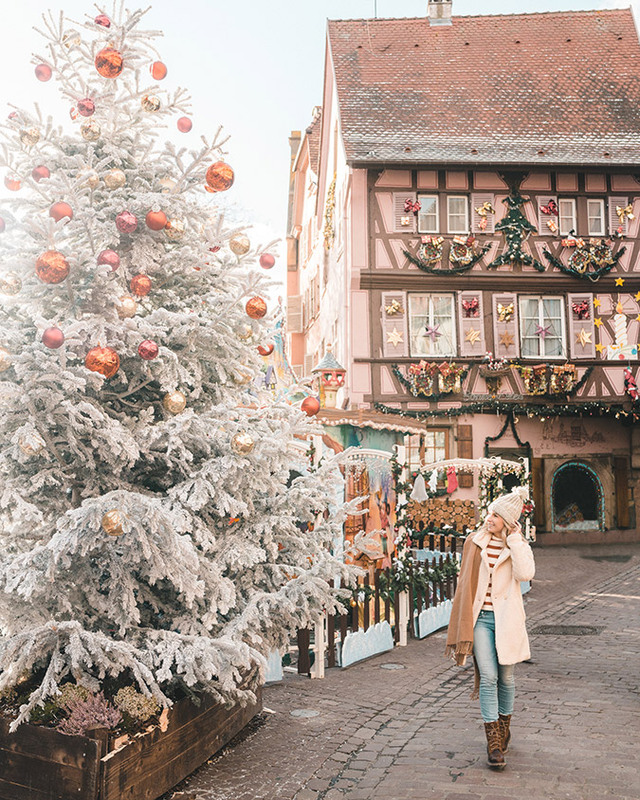 Colmar has been voted the best Christmas Market in France, and it’s easy to see why people love it so much. 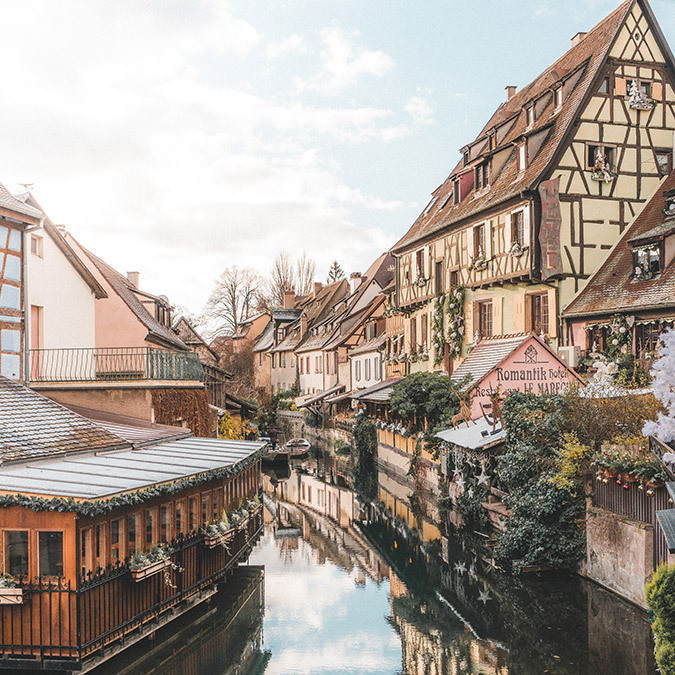 The city is exceptionally quaint, with old-fashioned French architecture and canals. This market was definitely smaller than Strasbourg, but has lots of charm to make up for it. 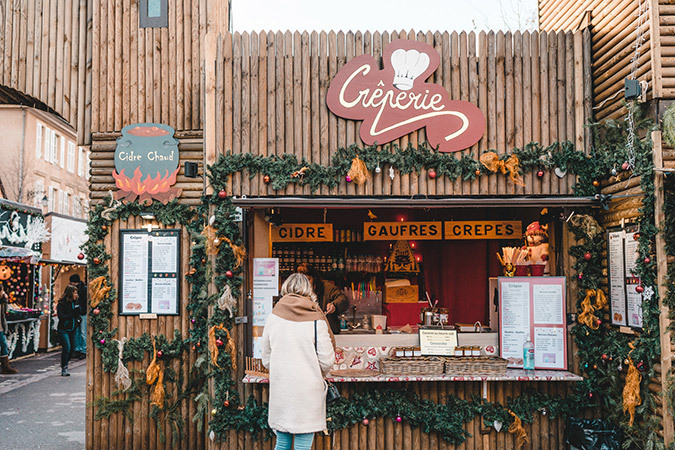 Instead of the market taking place in a main square like most do, there are five smaller markets spread out across town, which allows you to wind your way through the old buildings to discover different stalls. 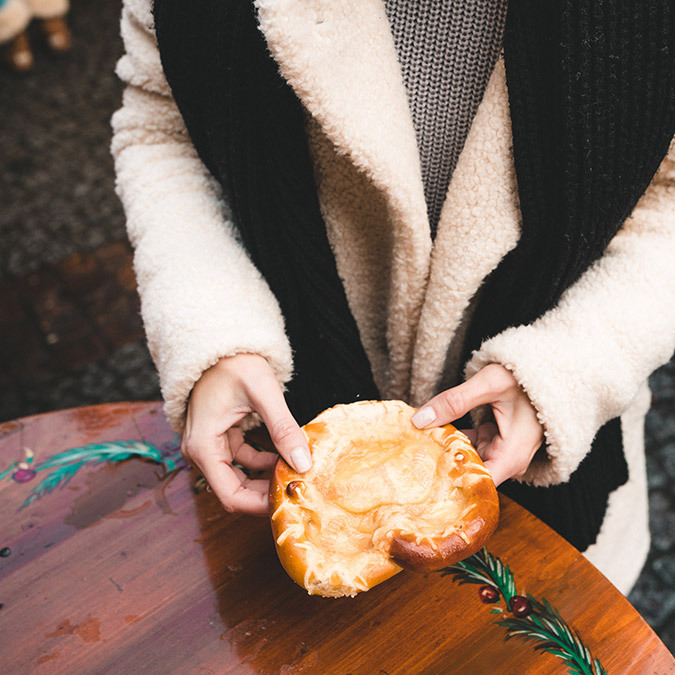 What we bought: Nutella crêpes and freshly-baked pretzels. 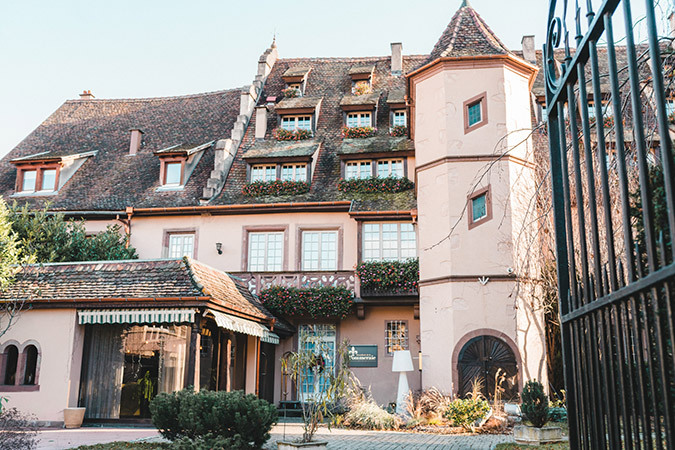 Where we stayed: Hostellerie De La Pommerie again, outside of Colmar. If you want to stay in Colmar, Hotel Le Columbier and Hotel Le Marechal are great options. This market was our favorite of the trip. 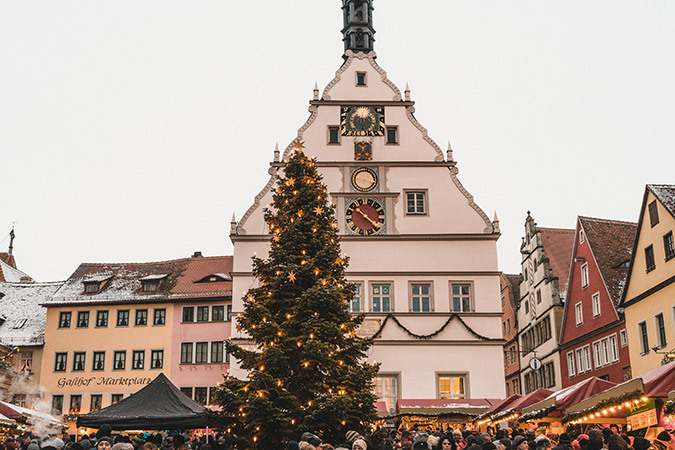 Everything from the location (the cutest medieval German town), to the atmosphere (carolers set up in the main square), the items for sale (handmade ornaments and traditional German Christmas decorations), and the food (endless Gluhwein stands and some delicious German brats and burgers) was perfect. It snowed while we were here, which added to the beauty of it all. I’d definitely recommend this market for anyone who appreciates a more authentic feel and plenty of city streets to explore. 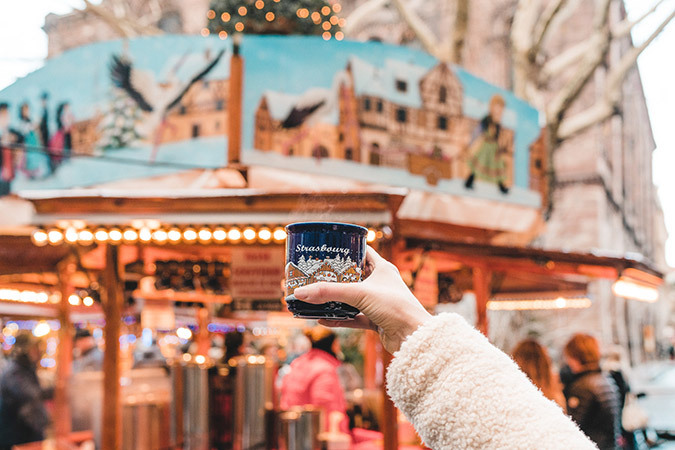 What we bought: Rothenburg Snowball, and “white” mulled wine. Where we stayed: We continued on to Nuremberg this evening, but I would’ve loved to stay at the Hotel Goldener Hirsch. 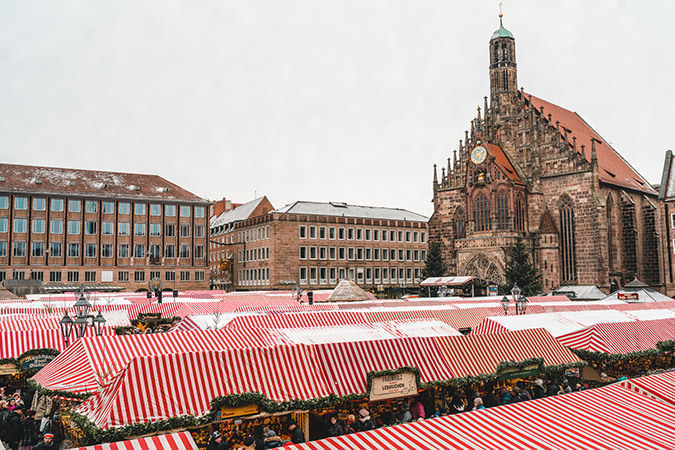 Nuremberg’s Christmas Market is definitely one of the more impressive. To enter the town you’ll pass through the old city walls, which you can still walk on to this day. 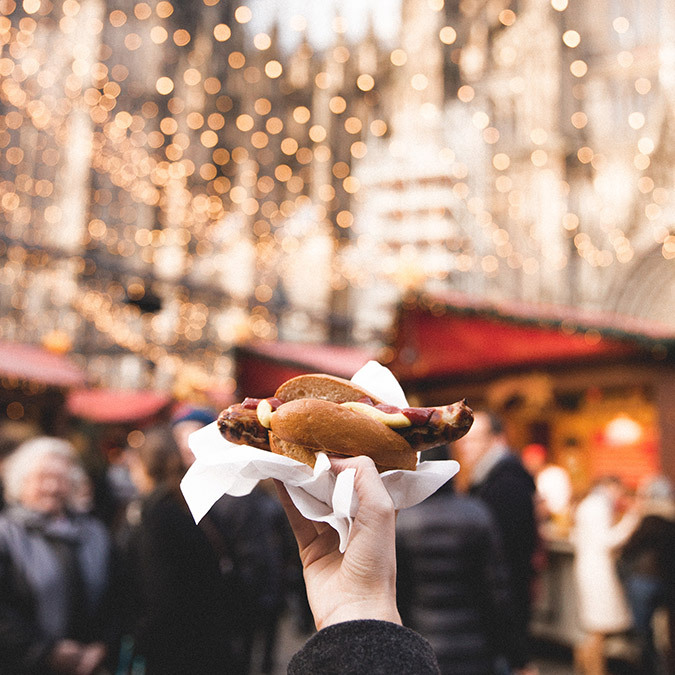 The main square hosts the largest number of market stalls, and they’re filled with plenty of fun Christmas ornaments, hot wine and beer, and of course: sausages. 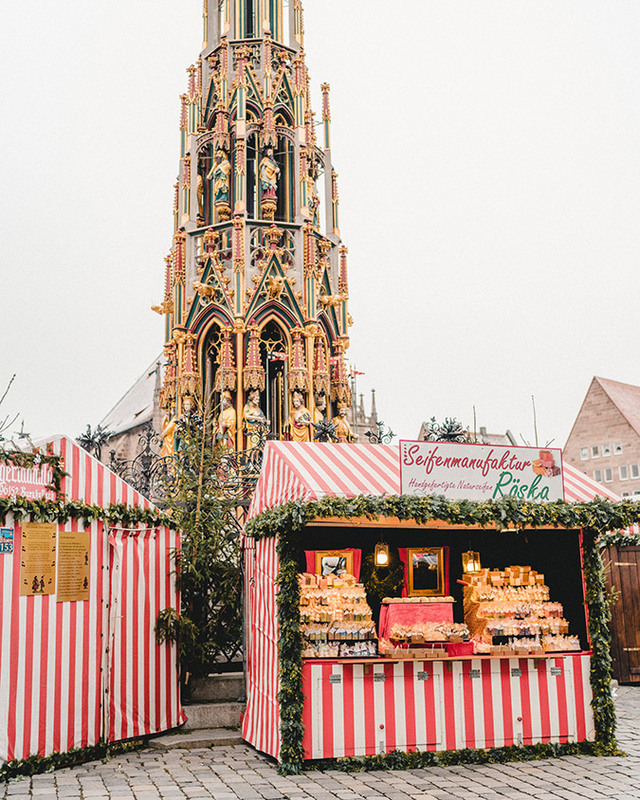 If you have time to explore the city, there’s plenty of museums and restaurants to try in this Bavarian city. 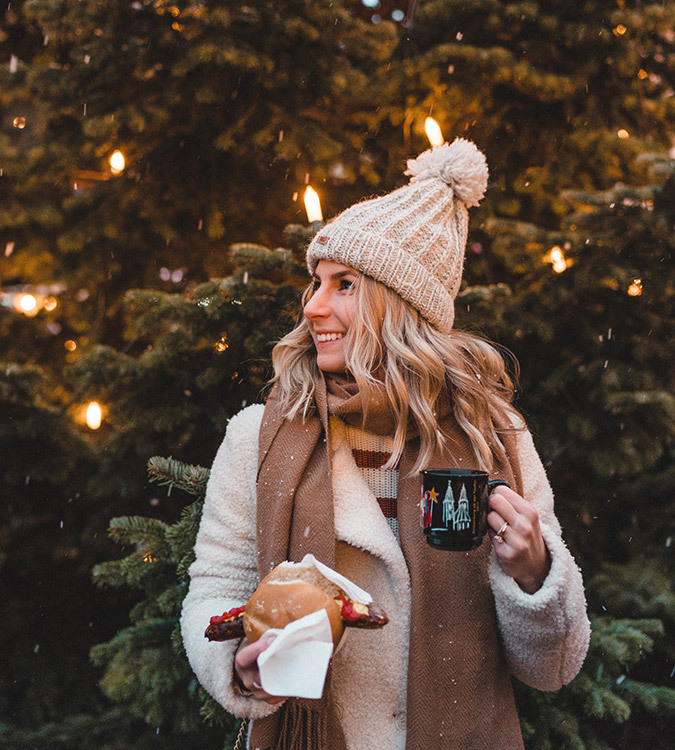 What we bought: Nuremberg sausages with sauerkraut, Nuremberg gingerbread and chocolate wine. Where we stayed: Dürer Hotel Nuremberg, which was located just steps away from the old city walls and a short walk to the market. 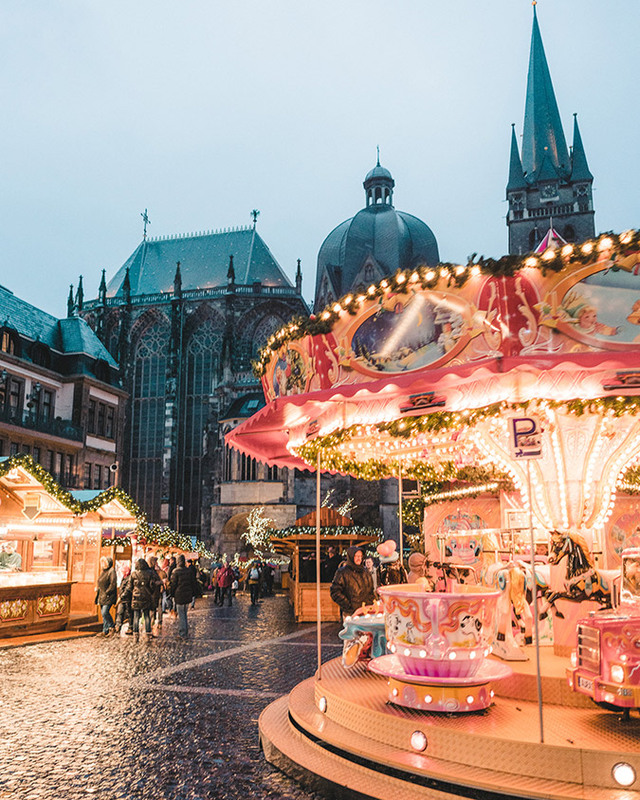 Though Cologne is a large city, the Christmas Market here feels exceptionally cozy. 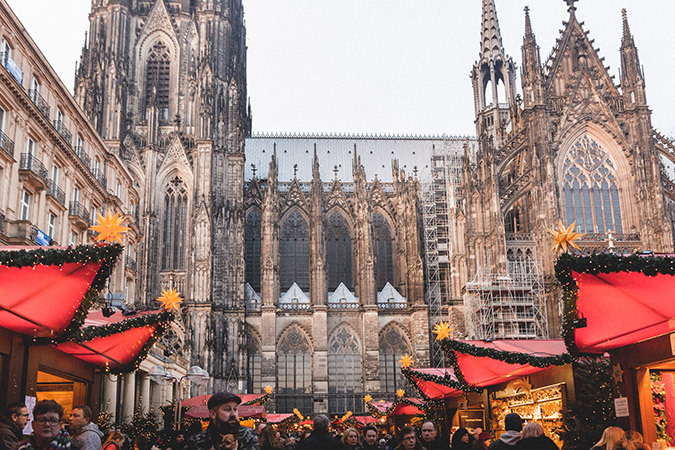 I loved walking amongst the red stalls and twinkle lights with the impressive Cologne Cathedral in the background. 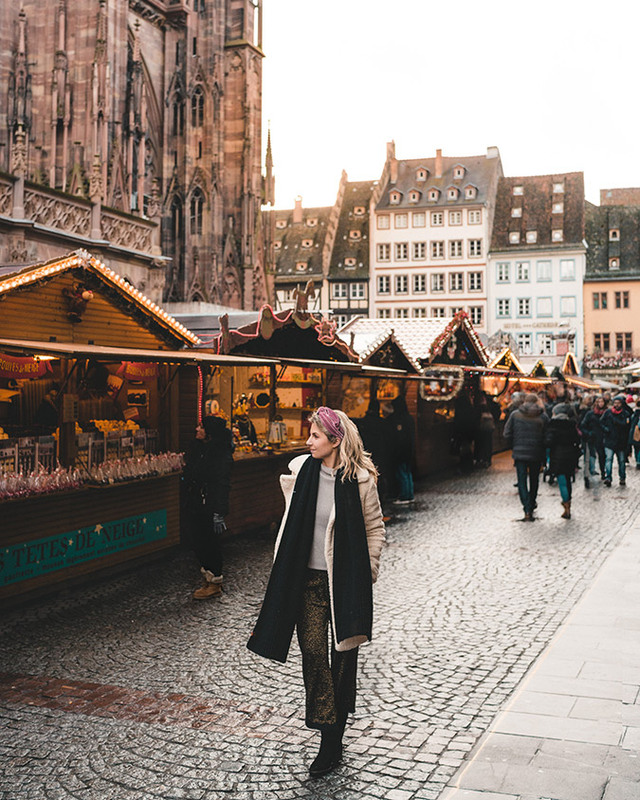 If you’re just looking to visit a couple markets, I’d highly recommend including Cologne on your list for its exceptional food, a variety of handmade items, and festive decor. What we bought: Spaetzle (soft egg noodles) and Käsekrainer (cheese-filled sausage). 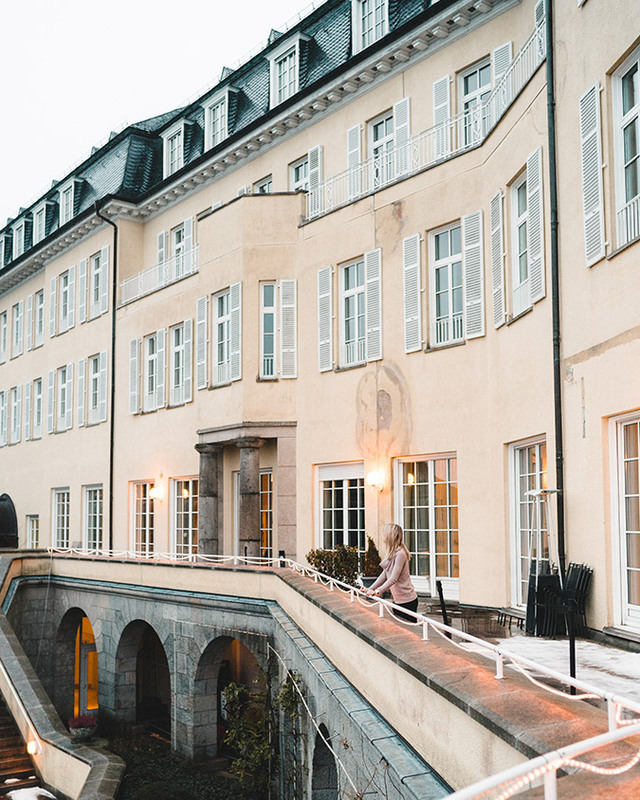 Where we stayed: We drove into Cologne, and had an incredible stay one town over at the Steigenberger Grandhotel Petersburg. It’s a historic hotel situated overlooking the Rhine River that has accommodated the Queen of England in the past! If you want to stay in Cologne, I’d recommend checking out Hotel im Wasserturm and Excelsior Hotel Ernst.